From evolving into a new grantmaking focus or incorporating the next generation of foundation leaders, CivicAIM helps grantmaking entities and foundations articulate, organize, and execute important transitional stages. 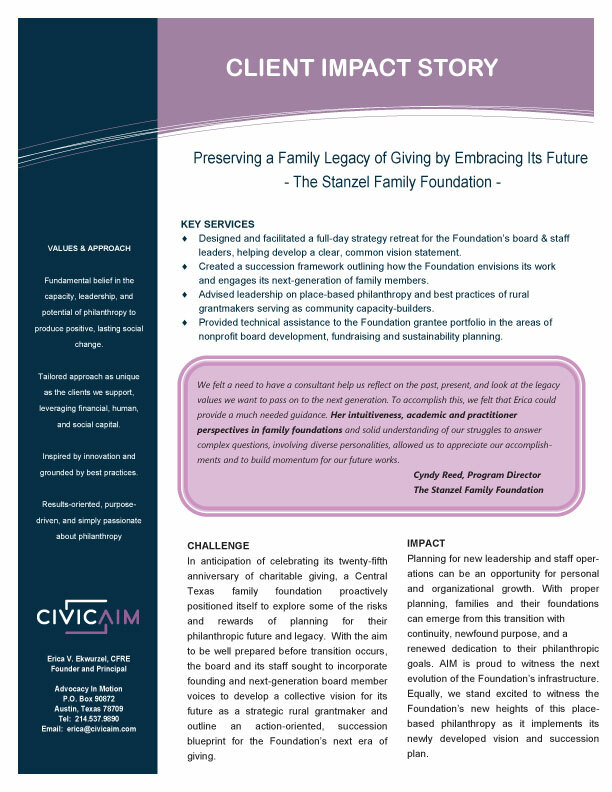 CivicAIM recently took on the task of helping a family foundation organize the transition of incorporating more of the next generation into the foundation’s work. Created a customized plan to help the grantmaking foundation proactively advance toward their newly defined goals with the resources available to them. With a new plan that reflects the achievements of the past and the aspirations of future giving, a foundation can confidently move forward for years to come. For whatever organizational stage your foundation is at today, CivicAIM can develop a customized philanthropic strategy that helps you address and plan for key changes in operations and leadership both now and well into the future. Let’s set up a time to discuss your foundation’s future.